Steven Tyler was back in the saddle in Paraguay Wednesday night, the day after a slip in the shower put the singer, and his band, out of commission for 24 hours. Tyler was showering at the Bourbon hotel near Asuncion, Paraguay on Tuesday when he apparently became dizzy because of gastrointestinal problems, and slipped and fell in the shower. The rocker was taken to a local hospital where he was treated for three hours, to deal with cuts on his face and two missing teeth. A visit to the dentist set the American Idol judge up with two new dental implants. 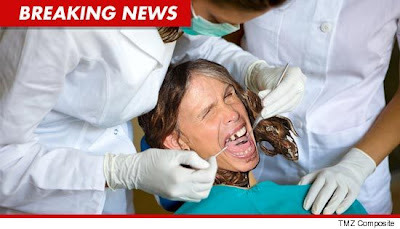 TMZ has a photo of Tyler at the dentist getting his repairs…. The Wednesday gig was held at the Asuncion Jockey Club. 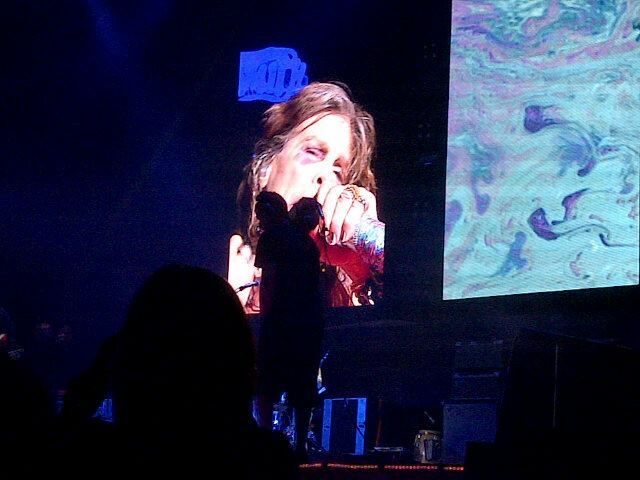 A fan photo from the show – just the second date on the band’s South American tour – shows Tyler sporting a black eye from his accident.